Balao Class Submarine: Laid down, 30 September 1942, at Cramp Shipbuilding Co., Philadelphia, PA.; Launched, 15 August 1943; Commissioned USS Lancetfish (SS-296), 12 February 1945, at Boston Navy Yard, Boston, MA. ; Decommissioned, 24 March 1945; Laid up in the Atlantic Reserve Fleet, New London Group; Struck from the Naval Register, 9 June 1958; Final Disposition, sold for scrapping, 20 August 1959 to Yale Waste Co., Boston, MA for $ 57,189.00. Specifications: Displacement, Surfaced: 1,526 t., Submerged: 2,424 t.; Length 311' 8"; Beam 27' 3"; Draft 15' 3"; Speed, Surfaced 20.25 kts, Submerged 8.75 kts; Cruising Range, 11,000 miles surfaced at 10kts; Submerged Endurance, 48 hours at 2kts; Operating Depth Limit, 400 ft; Complement 6 Officers 60 Enlisted; Armament, ten 21" torpedo tubes, six forward, four aft, 24 torpedoes, one 5"/25 deck gun, one 40mm gun, two .50 cal. machine guns; Patrol Endurance 75 days; Propulsion, diesel-electric reduction gear with four Fairbanks-Morse main generator diesel engines, 5,400 hp, Fuel Capacity 116,000 gal., four Elliot Motor Co., main motors with 2,740 hp, two 126-cell main storage batteries, two propellers. 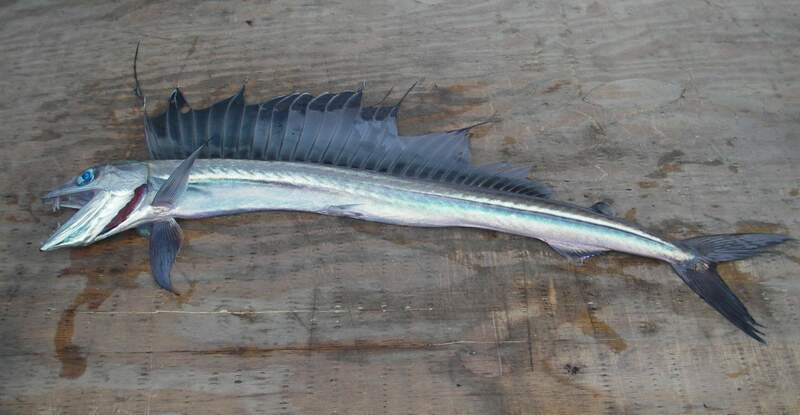 200k Alepisaurus ferox, a Lancetfish on deck. Photo courtesy of wikimedia.org. Far right - Miami (CL-89) - Furthest along; aft turrets and catapults in place. Left of Miami is Astoria (CL-90) - she is about a month behind Miami. Left of Astoria, in the large shipway, is Oklahoma City (CL-91) - a significant portion of hull has been built. Left of Oklahoma City is Little Rock (CL-92) - Keel was just been laid on 6 March, which is visible under crane structure. The coaling dock next to the cruisers site is known as grafitti pier" today. 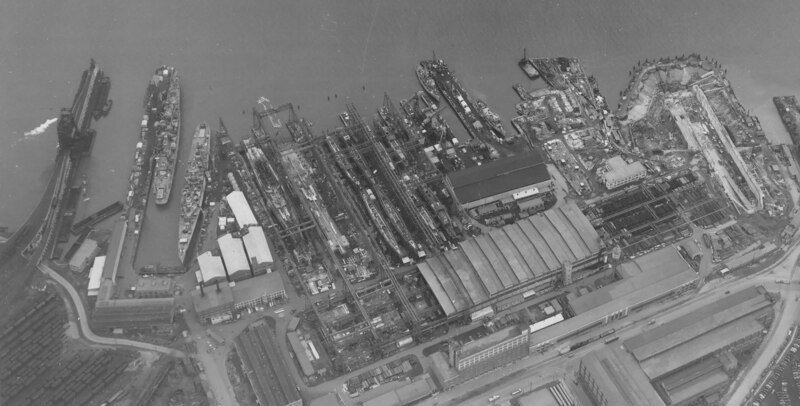 Note that there are also 2 ATF's: Seneca (ATF-91) and Nauset (ATF-89) fitting out on the right side near the graving dock being built which was never used when finished in 1945. It was fully functional, and used in the 50's when Keystone Ship Repair leased the property. Fast forward to 2014 when the last piece of the shipyard was demolished. The 'L' shaped building, across Girard Avenue which was the foundry & Machine Shop was the end. Lancetfish (SS-296) bottom left, row 3. Manta (SS-299) top left, row 4. The shipyard's submarine construction program was not especially successful. Poor management hindered the delivery of the boats. The first delivery was made two years after keel laying, and fitting out was then done by Portsmouth Navy Yard. The best construction time for a submarine was 644 days. Cramp's submarine construction story was not a happy one for the Navy. Even though they got an early start on their Balaos, they had a lot of difficulty in hiring skilled workers and managers as most of the good ones already had jobs. Quality and timeliness suffered as a result. 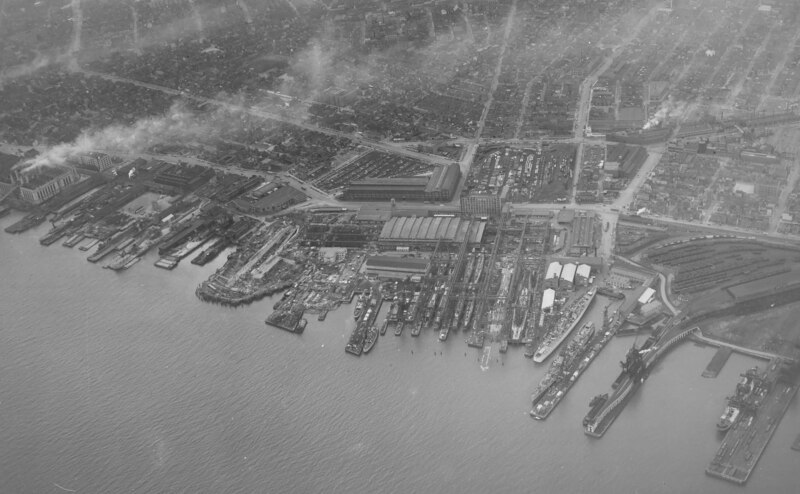 Cramp used the Government design plans, but used a completely different part numbering and inventory system, making coordination with Portsmouth, Boston, and Mare Island virtually impossible. The Government was forced to step in to straighten the mess out, with some of the boats ultimately being finished by other yards. Text courtesy of Tom Bateman, Dave Johnston. (USNR), Ron Reeves (of blessed memory), & Tracy White. USN photo # 80-G-38403 via Tom Bateman courtesy of Tracy White @Researcher @ Large. 500k Inverse of the above. USN photo # 80-G-38404 via Tom Bateman courtesy of Tracy White @ Researcher @ Large. 1.32k Launching of Lancetfish (SS-296) at Cramp Shipbuilding Company, Philadelphia, Pennsylvania, 15 August 1943. 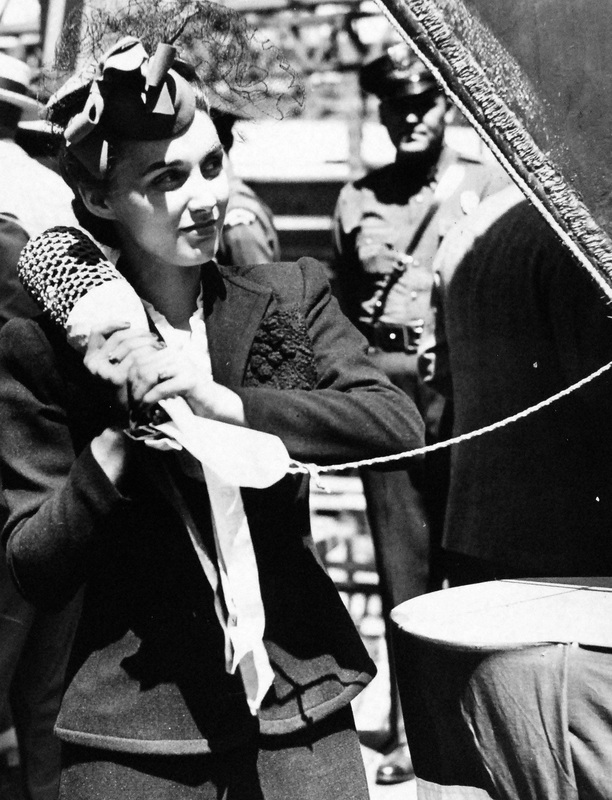 Shown: Miss Beatrice Barker, sponsor, christening the ship. USN photo # 80-G-207951, courtesy of the Library of Congress, from the National Museum of the U.S. Navy, via flickr.com. 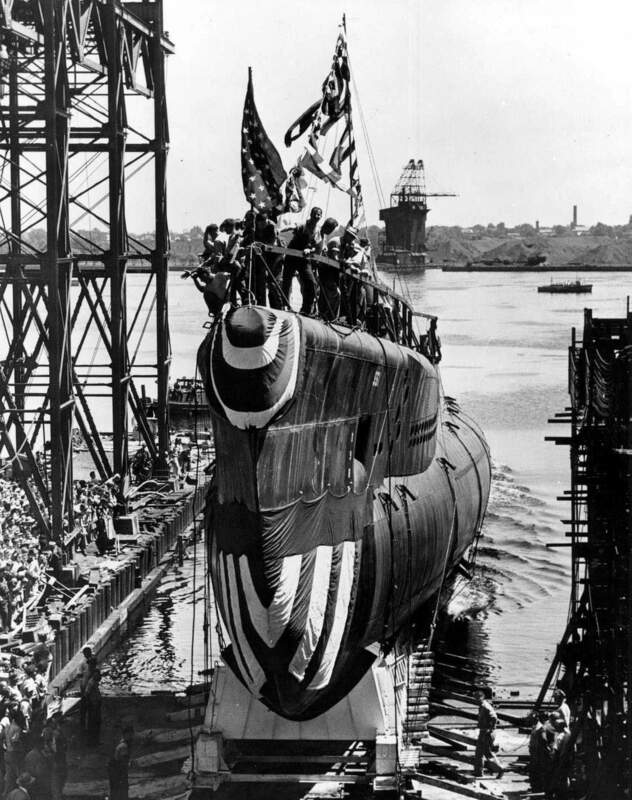 253k Lancetfish (SS-296) launching ceremony, 15 August 1943 at Cramp Shipbuilding Co., Philadelphia, PA. Note the numbered 554 on her hull, the numbers on their side are undoubtedly an internal construction number used by Cramp. Simon Lake also used in-house numbers on his O & R class boats while they were still in his yard. In the case of Cramp, the use of these numbers appears to be limited. Not all of the launch photos for their boats show the numbers. Being a late comer in the sub construction business, Cramp had tremendous problems in hiring skilled workers. Most of the good ones had already been hired by other firms in the rapidly expanding war economy. Putting these numbers on these boats may have been a way of keeping things from getting mixed up. U.S. Navy # 80-G-207952, courtesy of NARA. 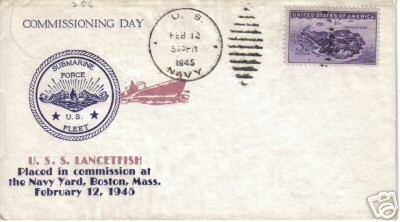 18k Commemorative postal cover issued on the occassion of Lancetfish's (SS-296) commissioning, 12 February 1945, at Boston Navy Yard, Boston, MA. Courtesy of Jack Treutle (of blessed memory). 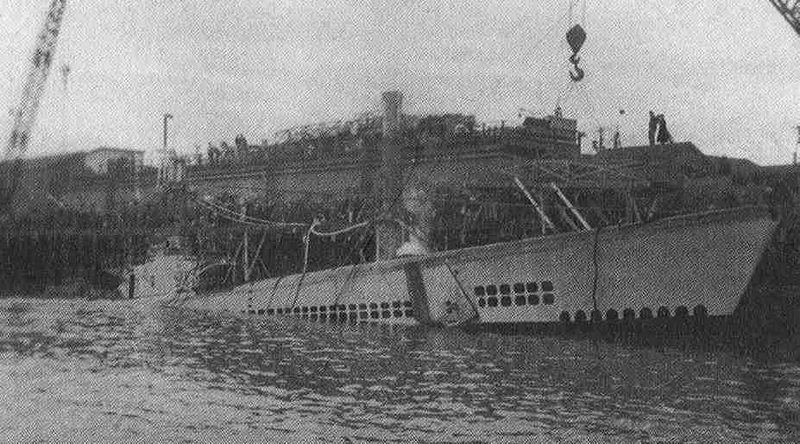 188k Beginning of the salvage operation on the Lancetfish (SS-296), 23 March 1945, eight days following her accidental sinking at Pier 8 East of the Boston Navy Yard. 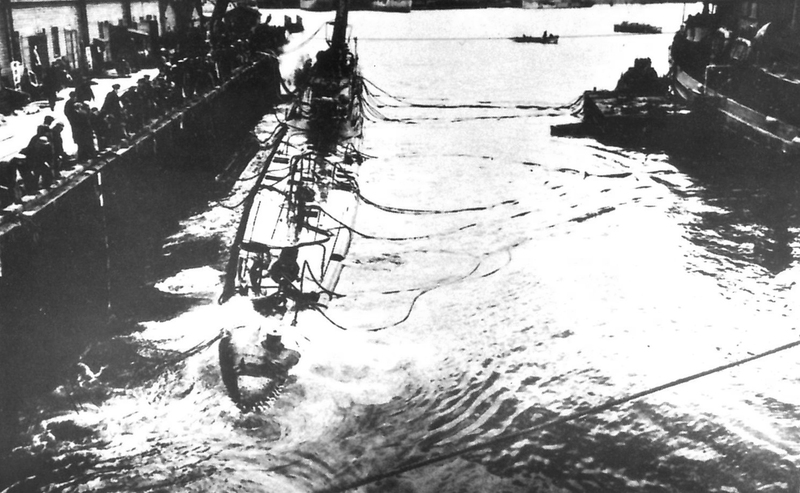 She would be decommissioned the following day, 24 March. USN photo courtesy of Scott Koen & ussnewyork.com. 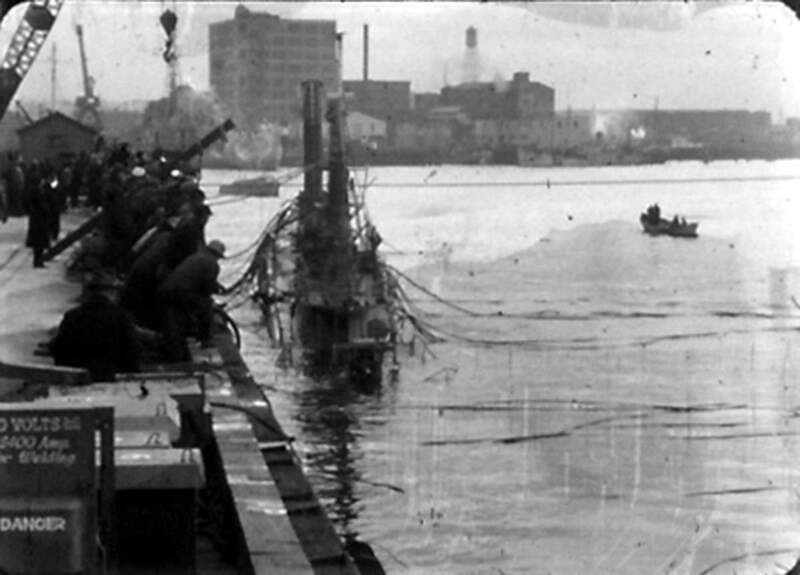 19k Beginning of the salvage operation on the Lancetfish (SS-296), 23 March 1945, at Pier 8 East of the Boston Navy Yard following her sinking at the pier on 15 March 1945. U.S. Navy photo, National Park Service, Boston National Historical Park, cat. no. BOSTS-16392, courtey of Stephen P. Carlson, Preservation Specialist, Boston NHP, Charlestown Navy Yard. 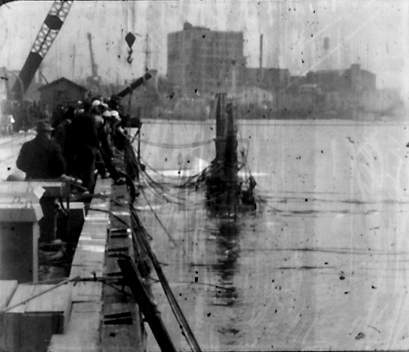 70k Beginning of the salvage operation on the Lancetfish (SS-296), 23 March 1945, at Pier 8 East of the Boston Navy Yard following her sinking at the pier on 15 March 1945. She is down by the stern. U.S. Navy photo, National Park Service, Boston National Historical Park, cat. no. BOSTS-16392,courtey of Stephen P. Carlson, Preservation Specialist, Boston NHP, Charlestown Navy Yard. 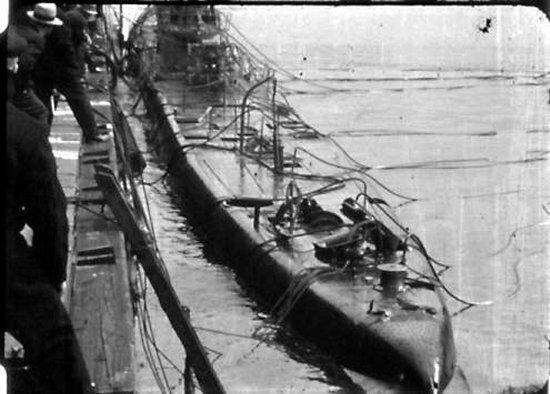 780k Lancetfish's (SS-296) deck still awash as spectators look on dock side. Photo i.d. courtesy of Robert Morgan. 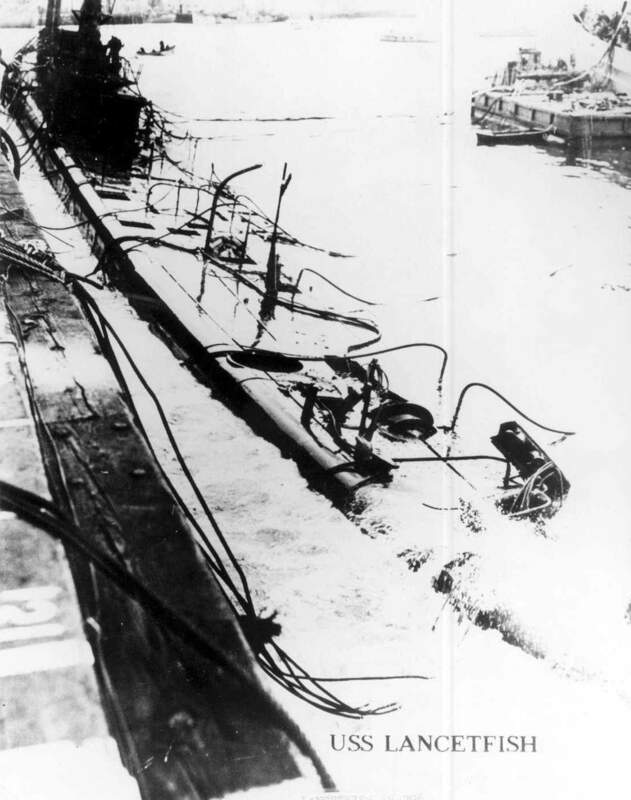 48k The Lancetfish's (SS-296) stern has been raised almost to an even keel with the rest of the boat in this 23 March 1945 photo at Pier 8 East of the Boston Navy Yard following her sinking at the pier on 15 March 1945. U.S. Navy photo, National Park Service, Boston National Historical Park, cat. no. BOSTS-16392, courtey of Stephen P. Carlson, Preservation Specialist, Boston NHP, Charlestown Navy Yard. 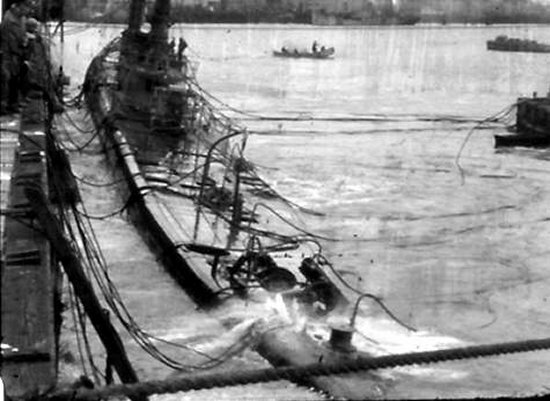 139k Lancetfish (SS-296), 23 March 1945, at Pier 8 East of the Boston Navy Yard during salvage operations following her sinking at the pier on 15 March 1945. U.S. Navy courtesy of NARA. Text i.d. courtesy of Stephen P. Carlson Preservation Specialist, Boston NHP, Charlestown Navy Yard. 47k The Lancetfish's (SS-296) stern has been raised almost to an even keel with the rest of the boat. U.S. Navy photo, National Park Service, Boston National Historical Park, cat. no. BOSTS-16392, courtey of Stephen P. Carlson, Preservation Specialist, Boston NHP, Charlestown Navy Yard. 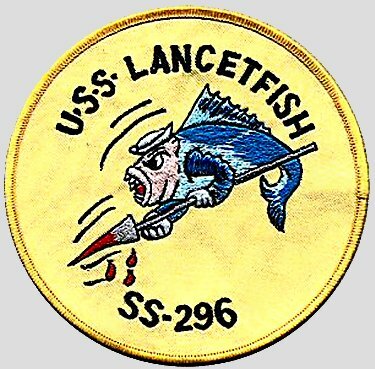 46k The Lancetfish (SS-296) is finally on a level keel, 23 March 1945, eight days following her accidental sinking at Pier 8 East of the Boston Navy Yard. U.S. Navy photo, National Park Service, Boston National Historical Park, cat. no. BOSTS-16392, courtey of Stephen P. Carlson, Preservation Specialist, Boston NHP, Charlestown Navy Yard.